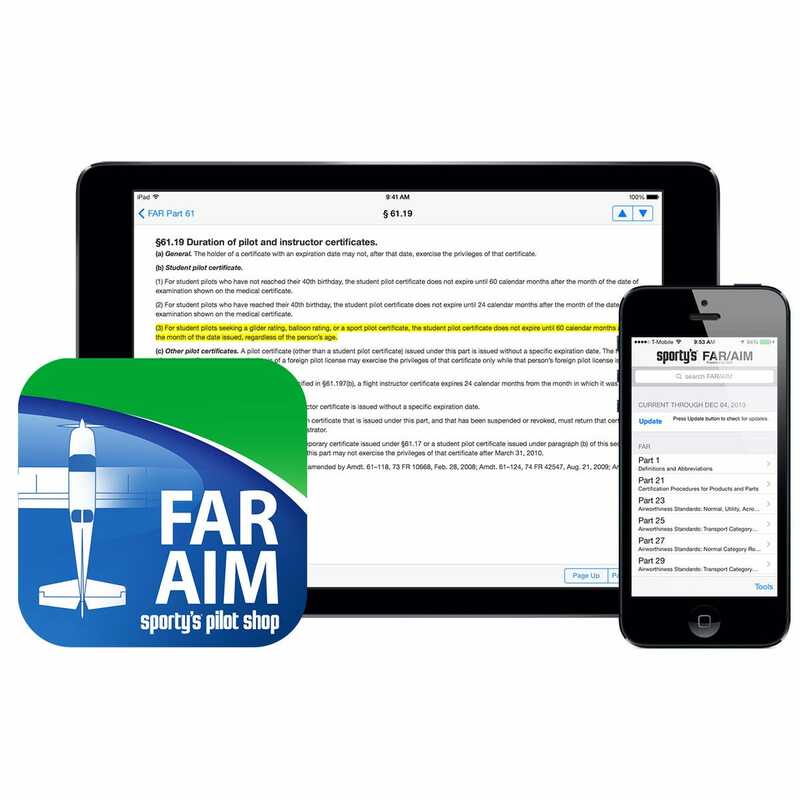 Sporty's Pilot Shop has been the best place to find printed copies of the FAR/AIM for over 50 years, and now we have the latest version available electronically in a dedicated app. 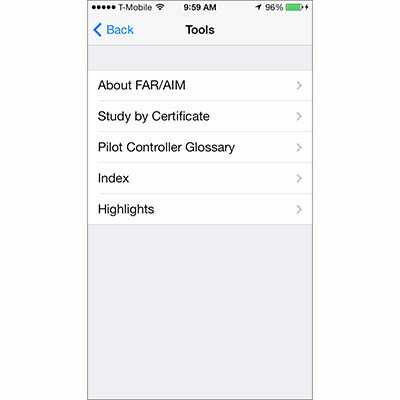 The FAR/AIM app contains information from Titles 14 and 49 of the Code of Federal Regulations (14 and 49 CFR) pertinent to pilots, flight instructors, and flight crew, combined with the Aeronautical Information Manual (AIM), and Pilot/Controller Glossary. 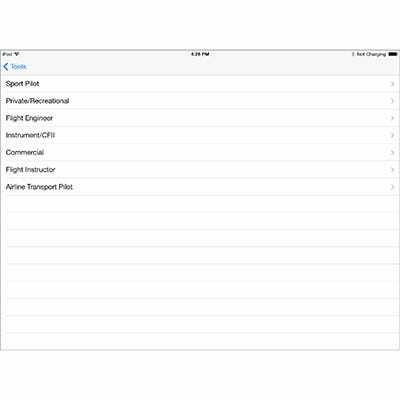 • All of the ASA FAR/AIM and FAR for Flight Crew book contents are included: 14 CFR Parts 1, 21, 23, 25, 27, 29, 39, 43, 61, 63, 65, 67, 71, 73, 91, 97, 103, 105, 110, 117, 119, 120, 121, 125, 133, 135, 136, 137, 141, 142; 49 CFR Parts 172, 175, and 830; TSA 1544 and 1552. 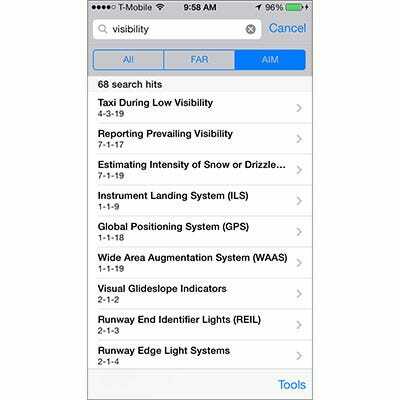 • The popular, user-friendly and fully searchable combined FAR and AIM index from the ASA FAR/AIM printed book. 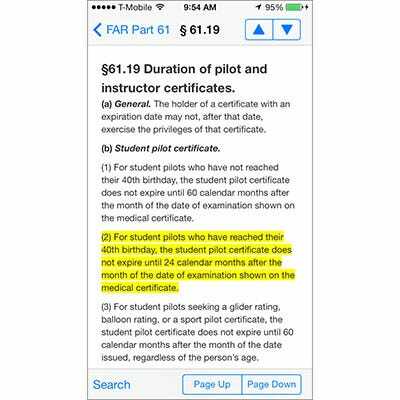 • Study by Certificate lists for Private, Sport, Instrument/CFII, Commercial, Flight Instructor, Flight Engineer, and ATP allows aviators to hone their studies to the pertinent rules for their individual certificate and operation. 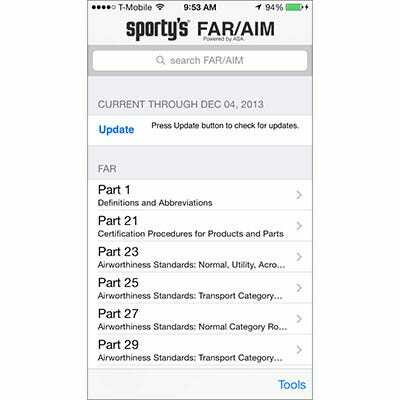 • Includes the ability to highlight any selection of text from the FARs or AIM and save it for quick access later. None of the material in this publication supersedes any documents, procedures, or regulations issued by the Federal Aviation Administration (FAA). Sporty's does not claim copyright on any material included herein that was taken from United States government sources; all contents originate from the FAA. How do I remove a highlight once I know longer need to reference it? BEST ANSWER: I would recommend searching the Google play store for the app. Not sure if there is an Android version. How often are the FAR's updated? BEST ANSWER: The FARs are updated as needed. Typically there is one major update a year. 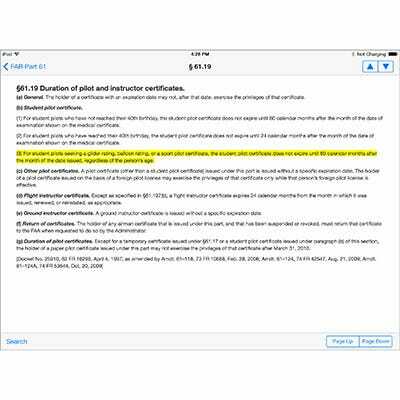 I’m curious about why FAR/AIM books/apps don’t include 14 CFR Part 47. Do you know why? BEST ANSWER: I am now t sure why. I will see if I can find and answer and post it here. Does it include Part 107? BEST ANSWER: Yes, it included part 107. Is there a cost for the annual updates? BEST ANSWER: No, it will update from the app store. does the app update each year as new far aim versions are published? Is there an ability to sync highlights to a backup ipad? BEST ANSWER: You can download to a second device but there is no ability to sync the devices.